The capital of the United States is home to a massive collection of museums, monuments and history, most of which are free to the public. Spending a weekend in Washington means endless opportunities for the whole family without breaking the bank. If you’re wondering what to do in DC this weekend, I have put together some of the best activities and attractions in the city. So, let’s dive into DC! There are three major airports in the Washington, DC region: Ronald Reagan Washington National Airport (airport code: DCA), Washington Dulles International Airport (airport code: IAD) and Baltimore/Washington International Thurgood Marshall Airport (airport code: BWI). Both American Airlines and United Airlines service all three airports. For general information about how to navigate to and from these airports, discover the best transportation options for your trip here. Find and book a rental car at rentalcars.om. The company is affilated with Booking.com so you know they are reliable. This website shows how to get anywhere by plane, train, bus, ferry and car. If you plan to spend a weekend in Washington, you will need a place to stay. Fortunately, Washington, DC is tucked between Virginia and Maryland, along the Potomac River, and is only 68.34 square miles in size. Thanks to its small area, it’s easy to navigate and explore the nation's capital using the metro, which can expand out past the DC limits into Virginia and Maryland. If you want a hotel in DC but don’t want to drive through the horrible traffic, stay in a hotel near the DC metro lines. This will make your life a lot easier and you’ll save some money too, because Washington, D.C. has high parking rates, and spots can be hard to find. If you’re planning a trip to DC and intend to stay in the outskirts, Arlington, Virginia is a convenient place to stay for cheaper hotels. It offers easy access to metros taking you into the heart of DC. This is a fantastic way to save some money without really compromising on convenience. Now that you have a home base and a way to get around, if you’re headed to DC this weekend, my first suggestion is to visit the National Mall. And no, the National Mall isn’t a shopping mall. Despite its name, it’s actually a huge park that extends from the Lincoln Memorial in the west, to the Capitol Building to the east, with tons of free museums and landmarks in between. This is where you can find most of Washington's best attractions. The Smithsonian is one the most fun things to do in Washington DC, thanks to the many different types of museums available to visitors. Named for its founder, British scientist James Smithson, the Smithsonian Institution is a group of museums and research centers administered by the United States government. There are so many items in its collections that they can’t fit into one building. Actually, there are so many artifacts that only a fraction are on display at any one time. Most of their items are in storage! Sensibly, they have grouped their collections by topic. This works out well if you’re visiting Washington, because you can spend your time in museums that interest you. Even better, all the museums on the National Mall are literally so close together that you won’t have to walk far to get from place to place. Many of these museums are extremely popular and can be very crowded. However, the benefit of being in the National Mall area is the fact that the next museum or garden is only a hop, skip and a jump away. The Smithsonian caters to anyone’s preference whether it’s science, history or art. Oh, and did I mention that all these museums are totally free? Tip: Some museums offer guided tours at certain times of the day. If you aren't fond of going with a group, Get Your Guide offers private tours as well. Learn more here. No weekend in DC would be complete without a visit to the Capitol Building; it’s one of the most impressive and important buildings in the world. 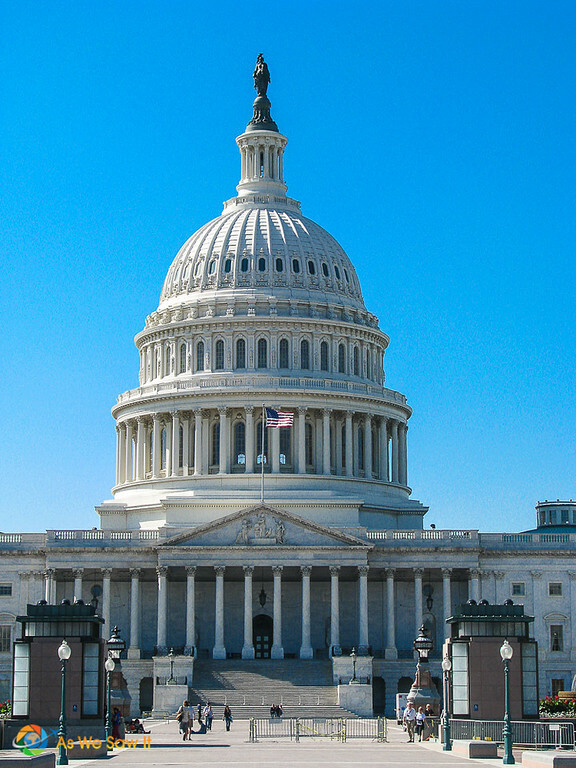 It houses the United States Congress and serves as a meeting place for the House of Representatives. 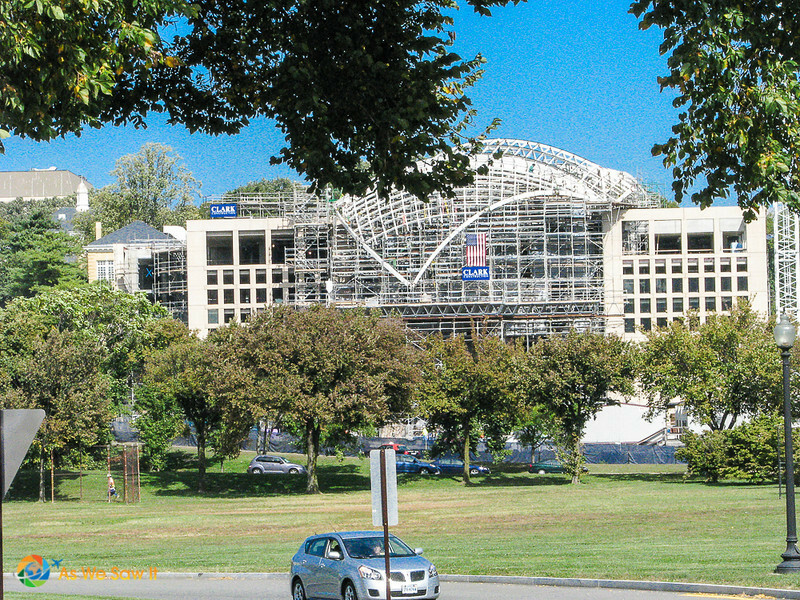 One of the most interesting facts about the building is that its design began as a contest, proposed by Thomas Jefferson, with a prize of $500 (around $14,000 in today’s money). After the design was chosen based on William Thornton’s entry, the Capitol Building faced many hardships, changes and destruction. During the War of 1812, constant raids and fire nearly destroyed the building, if not for a lucky storm that put out the fires (which burned and gutted the inside of the building). The building has been rebuilt over and over, creating the symbolism of perseverance that it holds today. It may surprise you to know that as you approach the Capitol Building from the National Mall, you are actually seeing the back of the building, rather than the front. Actually, it turns out the building entrance faced east (away from the National Mall). A little confusing, but it was done for a reason. At the time it was built, the land on the eastern side was the most level. They reasoned that it made more sense for travelers to go in that way (interesting, right!?). A word of warning to those looking to visit, though: Tour spots fill up fast, so make sure to plan ahead and book a tour to avoid the massive crowds and long waits. In the spring and summer, it’s almost impossible to get a same-day tour pass, unless you arrive first thing in the morning. Tip: If you don’t care about getting inside, you can book a guided walking tour of the area instead. See the exterior of the Capitol Building and Supreme Court, the main reading room of Library of Congress, and the Thomas Jefferson library, featuring a real Gutenberg Bible. Learn more here. Next, on our list of things to do in DC this weekend, travelling west from the National Mall, we have the iconic Lincoln Memorial. Even from a distance, you can see the 555-foot high obelisk dedicated to the first president of the United States. Up close, the obelisk is massive, with two shades of stone from the bottom half to the top half. It turns out the monument dedicated to George Washington had undergone changes and trials of its own, just like with the Capitol Building. 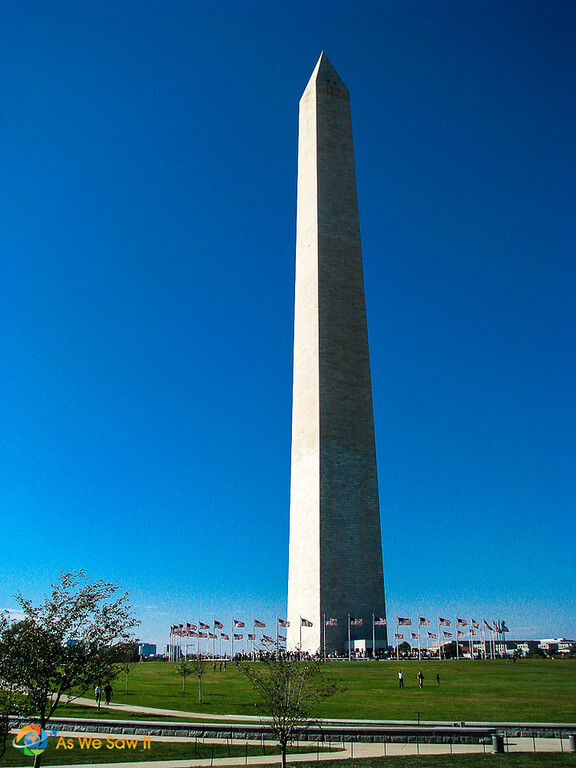 George Washington originally scrapped the idea of having a monument built for him, to save federal money. Plans for the monument started even before Washington was president, to commemorate when he was Commander-in-Chief of the American Army during the Revolutionary War. The design was originally set to look like a pantheon, or a temple building, with the obelisk in the center and huge statues surrounding it, until it was scrapped due to changes in architectural tastes. It took over 100 years for the monument to be completed. One of the monument’s most fun features is that you can go inside and take the elevator up to the observation deck for an incredible view of DC from 500 feet up. Ten feet below the observation deck, there’s also a small museum dedicated the first president. The Lincoln Memorial is another Washington DC weekend must-see, a symbol representing America’s beloved 16th president Abraham Lincoln and race relations. With a large, seated Lincoln, the base houses an inscription of two of his most iconic speeches: the Gettysburg Address and his second inaugural address, near the end of the civil war and slavery. Dr Martin Luther King stated his famous “I Have a Dream” speech here. Walking from the Washington Monument to the Lincoln Memorial, you will pass the reflecting pool full of ducks and geese. Hold your nose – the water doesn’t smell too good – but it’s positively picture-worthy from either end. Reaching the base of the memorial, you’re greeted by tons of people, mostly tourists, taking pictures and relaxing on the steps. Walking up the steps, you may find yourself feeling a little bit like Rocky Balboa (even though those steps are actually in Philadelphia). Greeted by Lincoln, the main structure is incredibly beautiful and gives a great view of the reflecting pool and the Washington Monument. What’s even better, is seeing it at night, when the lights make the exterior glow. The inside lighting is brightest on the statue of Lincoln too, making it even more awe-inspiring and strangely calming. Tip: Security doesn’t allow anyone to have any beverages here, so throw your water or soda away before you walk up the steps. Just as with the Capitol Building, the White House went through its own trials, especially during the Burning of Washington, which had also affected the Capitol Building. It wouldn’t be a trip to DC without visiting the White House and it does make for a great photo! Getting tickets to tour the White House will require some planning ahead. Once you've determined the days you will be visiting Washington DC, contact your member of Congress and request tickets to tour the White House. I would suggest contacting both of your Senators and your Representative. Some have a more diligent staff than others. Most of this is handled by interns. Your Washington weekend trip needs just one more activity in order to be complete. Right across the Lincoln Memorial, on the other side of the Potomac River, is the Arlington National Cemetery. Technically it's located in Arlington, Virginia, but like all major institutions, it has a DC address. Arlington Cemetery is the burial site of many historical figures and military personnel who continued to fight and pave the way for the freedom of the United States and its people. 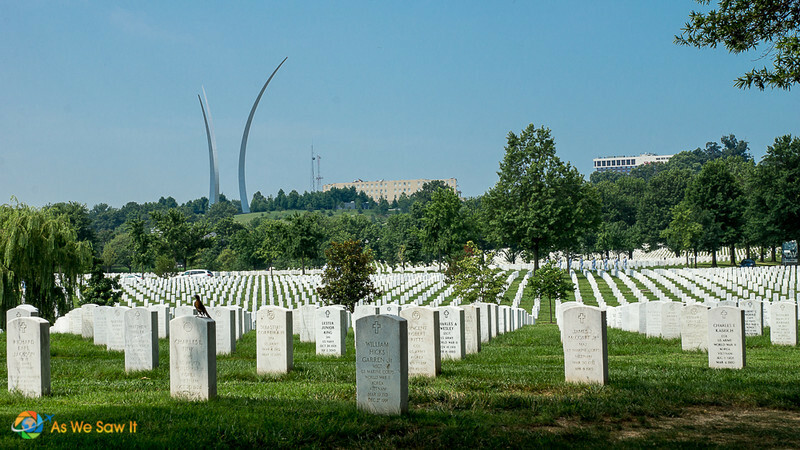 Arlington Cemetery is 624 acres with over 400,000 graves, so getting lost is very possible. Thankfully, if you start at the welcome center, you can grab a map and get a brief history lesson about the cemetery. When entering the cemetery, you’ll almost certainly be screened by security. Nothing to worry about. The cemetery is run by the United States Department of the Army and routinely requires security screenings for safety reasons. 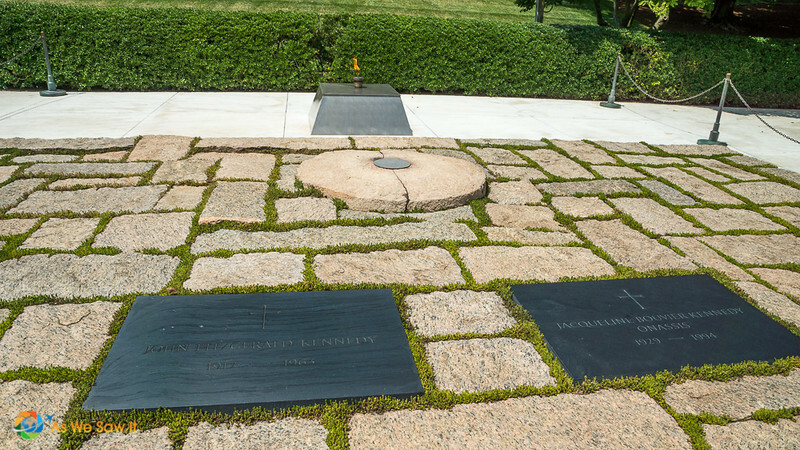 One of the most famous sites to visit at the Arlington Cemetery is the John F. Kennedy gravesite. The 35th president is one of only two presidents to have been buried in Arlington (the other being William Howard Taft). At his grave are plaques for him, his wife Jacqueline and their daughter; as well as the John F. Kennedy eternal flame. The cemetery also houses the Arlington Memorial Amphitheater, a huge and beautiful amphitheater used for state funerals, speeches as well as Memorial Day and Veterans Day ceremonies. 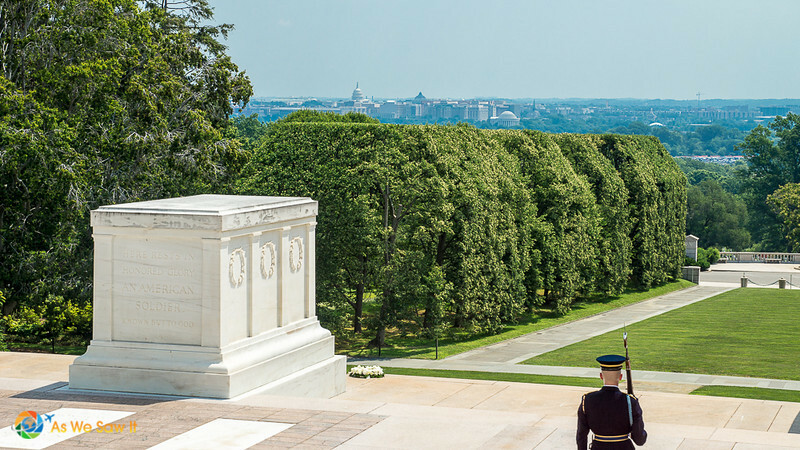 Connected to the amphitheater, is also the Tomb of the Unknowns (or Tomb of the Unknown Soldiers), dedicated to armed servicemen who died unidentified through military conflict. The tomb is protected by guards 24/7, through drenching thunderstorms, frigid blizzards and blazing heat waves. It’s really quite a sight to see the dedication that the soldiers have, and only a small percentage of soldiers are allowed to protect the tomb. Up on a high hill in the middle of the cemetery is a Greek Revival mansion known as Arlington House, or the Custis-Lee Mansion. The mansion was built in the early 1800s, long before the national cemetery was established. It was owned and constructed by the first president's adopted grandson, George Washington Parke Custis, upon an 1,100-acre tract of land which he had inherited. One last interesting fact about Arlington National Cemetery is its designation as a Memorial Arboretum. Walking through the cemetery you’ll see thousands of different species of trees that are scattered throughout the landscape, making this cemetery an incredible sight in all seasons. Be it spring, summer, fall or winter, there are always trees blooming, with origins from all across the globe. For any nature lover, history buff, or avid sightseer – I can’t think of any place as humbling and beautiful as this cemetery. What's your favorite attraction in Washington DC? Chime in below! 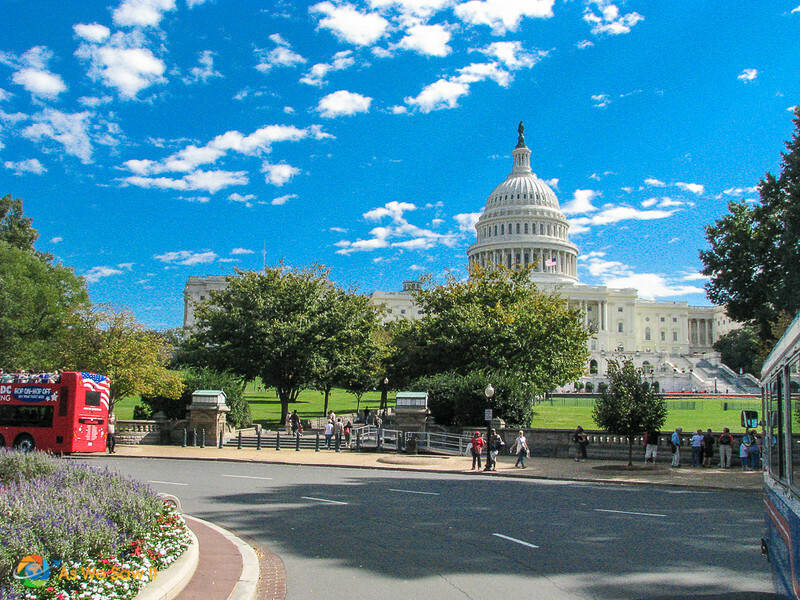 More trip ideas: Visit the official travel website: Discover Washington, D.C.
Find a hotel near the DC Metro here. Search for other hotels in Washington DC on Booking.com. I’m Kate Howard, a DC-based mom of one. I’m also a kindergarten teacher. I’ve both lived and vacationed in Washington, DC more times than I can count. You’ll probably find me riding my bike both for fun and to avoid the city’s insane traffic and parking.